As I mentioned in Real-Time Collaborative Editing, I had a fantastic experience participating in group editing of a Mind Map of collaborative tools during a session at Learn Trends. You can see the result below. But it was interesting to see the results exported which I've embedded below. I would expect the document to continue to grow and change, but thought it would be worth having it available in a text format as well (so I can find it when I need it). You need to add Edmodo to the list :) http://www.edmodo.com I am the co-founder. Followed your link from twitter, I am @zemote on twitter. Jeff - thanks for stopping by. You can probably get in and modify the original mind map. I would like to draw attention to the provider of this collborative mind-mapping service at mindmeister. I am not in any way related to the site or its providers except as a appreciative user who was able to add Ozity to this list of collaborative technologies. Ozity is a service of World Tutor Exchange of which I am a co-founder. NovaMind is listed without a link - it is at http://www.novamind.com , and it's both Windows and Mac. Quite an extensive list there! You might like to consider checking out Mikogo which is a free desktop sharing tool provided by BeamYourScreen for online meetings, Web presentations, remote support, and group collaboration. it is great to see Collanos Workplace listed under Project Management. It is a positioning we love to see since intercompany project teams are a user group we focus our development on. Still it would be interesting why you do not position Collanos in Workgrouping, File Sharing or Instant Messaging, since these are very obvious use scenarios for the solution. BTW we are going to launch Collanos 1.4 next week, it is available for Collanos beta user Ambassadors via http://www.collanos.com. It will have VoIP Audio Conferencing transparently integrated in Collanos Workplace. Please contact us any time for more information. some well known tools from HyperOffice, which would certainly make the cut in your list are the HyperOffice Collaboration Suite and HyperMeeting Web Conferencing. These two solutions are seamlessly integrable and perhaps the only integrated messaging, collaboration and conferencing solution in the market. This is a great map. Definitely something to keep and watch into the future. Another tool that was recently added is a Collaborative Review and Workflow tool for creative content. Cool stuff. Thanks again for sharing. Visitng your post resulted to be very beneficial for me because not only your list but also the refrences given by the commentors here were great. These comments are great. Certainly there are other things we can add. I see that Jeff has added edmodo to the mindmap. I'd recommend going to MindMeister and adding the other tools that you see missing. I'll re-export in a while and update this. 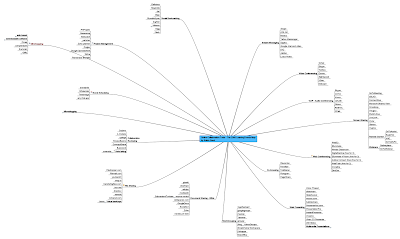 if you had used mindmanager 8 to create your map, we could have collapsed and expanded the topics to view it more clearly. the latest release of MM comes with a Player that lets you save maps off as .swf files that are postable, sharable and fully interactive. the only thing you can't do with a player file is edit it. pretty cool stuff. There's an export function. Do you want to do that and show us what would result in MM8? Thanks for the list. We use DeskAway for project collaboration. They even have a twitter-like "what are you working on?" update. Pretty cool. Tony, thanks for this list. Last week, Dimdim also introduced co-browswing. You could add Central Desktop to Project Management and ProofHQ to Collaborative Reviewing. Just to let you know that a new videoconference solution VISIOKONTAKT is going to be launched on the market on January 2009 by Strius, a french startup. Focused on real time sharing and true interactivity, Visiokontakt has a different approach of videoconferencing. Up to 20 simultaneous webcams in the standard edition (much more in the Pro version), high quality video and sound, multifunction whiteboard are some of the key features of this unique tool. The best of all the professional videoconferencing tools. If you want to get a demonstration to see by yourself the difference, just send me an email at fredmartin@strius.com with your contact details, and I'll will get in touch with you to schedule a demo. Thanks for putting Wrike on your list. We appreciate that! What a great list - thanks. As an eLearning specialist in a company that is watchisng its spend (as most are nowadays) this list is very valuable. Thanks for all the great posts. Nice list of collaboration tools. You missed Mindjet's MindManager Web & Mindjet Connect service which enable both Web & desktop users to collaborate together on mind maps. For any additional information on TeamViewer please don't hesitate to contact me. It is used for developing architectural/engineering designs and for remote design classes as well. Great list. Please consider adding OffBureau (http://www.offbureau.com), an online workspace that fuses online collaboration, document management and a social network. Great list here, one of the best I've seen. I typically use join.me or ScreenConnect for collaboration and meetings. Two great tools! We provide free online study tools for students such as mind maps, flashcards, study quizzes, study goals and more....for free! Our mind mapping tool is also great for brainstorming sessions!